At least 51 people were killed on Thursday morning in an airstrike that hit a hotel on the outskirts of Sanaa, Yemen’s capital, officials and local medics said. At least five children were among the dead in an air strike in a residential neighbourhood of Yemen’s capital Sanaa, the second day of mass civilian deaths in the war-torn country. The airstrike takes place a week before the Hajj pilgrimage, where millions of Muslims will congregate next week. A senior security official in Sanaa, blamed a military coalition led by Saudi Arabia for the attack on the Arhab district. Most of the dead in the hotel were merchants and traders. The Saudi-led coalition of Arab states launched its bombing campaign against alleged Iranian-backed Houthi rebels, who toppled the internationally recognised leadership in Yemen, in 2015. In a briefing, Stéphane Dujarric, spokesman for UN Secretary-General António Guterres, said he was told the Office of High Commissioner for Human Rights was investigating the incident. Rescue workers were still pulling bodies from the remains of the hotel on Wednesday afternoon, the strike was one of at least two dozen across the country, according to the Health Ministry. Yemen’s Interior Ministry said seven Houthi fighters died in coalition airstrikes at other locations in the capital. It is still unconfirmed how many exact civilian causalities have been caused by this air strike. Two-and-a-half years into its grinding civil war, Yemen is facing a near famine and one of the worst outbreaks of cholera in decades. Yemen is the poorest of Arab countries and is a country under siege from internal insurgents and a Saudi-led coalition of forces. Last week, the World Health Organisation reported that the number of suspected cholera cases in Yemen had reached 500,000 making it the largest cholera epidemic in the world. 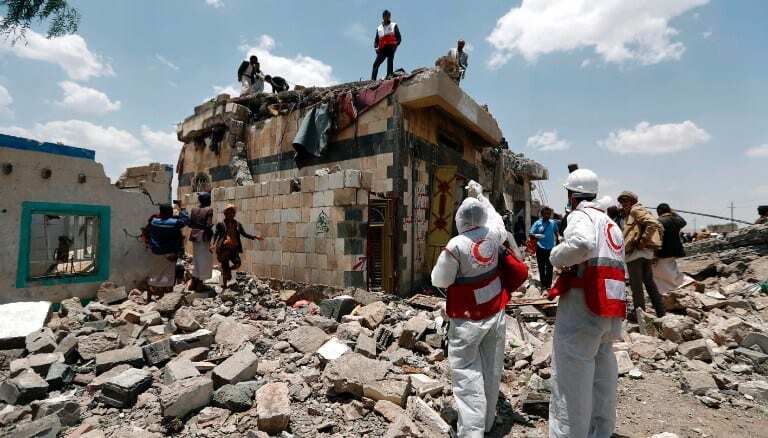 The attack destroyed two buildings on Friday in the southern district of Faj Attan, leaving people buried under debris.